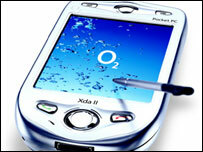 If you think big is beautiful then O2's newest mobile device - the XDA II - packs a heavyweight punch. But if you reckon the best things come in small parcels this leviathan PDA (Personal Digital Assistant) looks about as stylish as a donkey jacket. True, it is not as large or as heavy as the original XDA, though in a market where fashion, form and function collide it is not always the smartest device that wins out. How my children laughed when I showed them this new wonder of the age. "It's a brick," they hooted, "a paperweight, or better still a doorstop," they roared. "When I was a boy of 14, my father was so ignorant I could hardly stand to have the old man around. But when I got to be 21, I was astonished by how much he'd learned in seven years." They are young, they are foolish and they are not the target market. This is for grown-ups. Grown-ups who appreciate big-screen entertainment, solid form and sturdy build, where function matters more than looks and where the convention for ever smaller devices is disdainfully ignored. Well done designers. I spit on those dinky little smart phones where pudgy fingers struggle to cope with undersized keys, where the phone rings and an all-pocket search is required to find it. Imagine trying to read War and Peace through a letterbox and you realise how risible the small screen challengers are. So what do you get for the hefty £349 price tag (inc VAT, with a 12-month contract) compared with the earlier model? Well, if you cut off the parent's antenna, which is now housed inside the casing, add in a 640-480 pixel camera, and multi-media messaging, and tri-band, a faster 400MHz processor, double the memory, Bluetooth and a built-in electronic garage door opener you get the idea. OK, I lied about the last bit. For the technically-minded, questions about RAM, ROM, GPRS, VGA, SDIO and countless other acronyms will be looming large. It is probably best if you read the manual or ask the pub know-all, if you are not the pub know-all. O2 have bundled together a mobile Swiss Army knife of must-haves. And they appear to have realised that if they are going to grow the market beyond technically savvy early adopters they need to make a friendlier, easier interface for users. With that in mind they have revised the top end screen layout, with menus and sub-menus opening in the same frame, averting the need to drill down through layers of navigation. I liked the high level data shortcuts to news, sport and information services, although I declare a BBC interest here. This is good business too. Users of the XDA apparently generate more than three times the level of mobile data traffic than does the second most data-oriented handset - the Nokia 6310i. Making non-voice content easier to access equals more ARPU (average revenue per user). And I liked the picture album area, where pictures can be displayed fully across the screen and presented in a slide show. Gimmicky, but nonetheless appealing, are the photo contacts that allow pictures and ring tones to be assigned to specific callers. The separate volume controls for the touch screen and the phone are also a thoughtful addition. On the downside, the headphone socket continues to be sited on the bottom right hand side of the device meaning it sits askew in the pocket. It is also difficult to use an XDA with one hand. Finally, there is the unknown of battery life, an Achilles heel of the original. Version II slipped through my grasp too fast for a comparison but since the battery in the XDA II is removable, carrying a spare might be prudent.